Pool Filters 101: What Filter Is Right for You and Your Pool? The backyard pool, in-ground and above ground, has become so common we don’t give much thought to how it all began, but the swimming pool has been around much longer than you may have thought. There have been hieroglyphics found depicting swimming. It is believed the oldest man-made pool is located in what is now modern-day Pakistan. The “Great Bath” at the site of Mohenjo-Daro was constructed about 3000 BC. This pool’s sides and floor were made of bricks that were then sealed with two layers of tar. Another early man-made pool is located in Sri Lanka—the Sinhalese built “Kuttam Pokuna,” a pair of pools decorated with symbols of abundance. A recent discovery of an ancient pool occurred in Petra, the Red City, located in modern-day Jordan. You may know Petra as the location of the Indiana Jones movie called the Last Crusade. Petra has been studied by archeologists for some time; however, most of the research was focused on the temples, tombs, and other buildings. In 1998, Leigh-Ann Bedal was a PhD candidate working in Petra. There were three large flat areas that were believed to be marketplaces. Bedal decided to investigate the Lower Market to learn more about the trade in Petra. Very soon she uncovered the remains of what had been a large pool with an island pavilion. She also has found a very elaborate system of channels, storage tanks, and hydraulic systems that show the Nabataeans were experts at not only working with stone but also water. The indications are that the pool was surrounded by gardens of flowers and trees. This is amazing, as Petra is located in the middle of the desert and only receives less than 10 inches of water in a whole year. It is believed that the pool was connected to pools that previously had been referred to as the Middle and Upper Markets. The original pool Bedal discovered has continued to be studied with her as the lead researcher. They have not yet started studying the other pools. You can imagine the amazement of the travelers on camel caravans when they entered the narrow entrance between the desert and Petra. Suddenly, it opens to this city with amazing architecture cut into the stone walls, followed by a series of magnificent pools and gardens. That was the purpose of the original pools—they were made to impress the viewer with the magnificence and power of the owner, much like the pyramids of Egypt. It is believed that only the elite were allowed to use the early pools, and it is suspected that the early pools may have been used for religious occasions. Eventually, the Romans took over Petra and, when the spice trade was no longer required to travel over the desert, Petra eventually was abandoned. 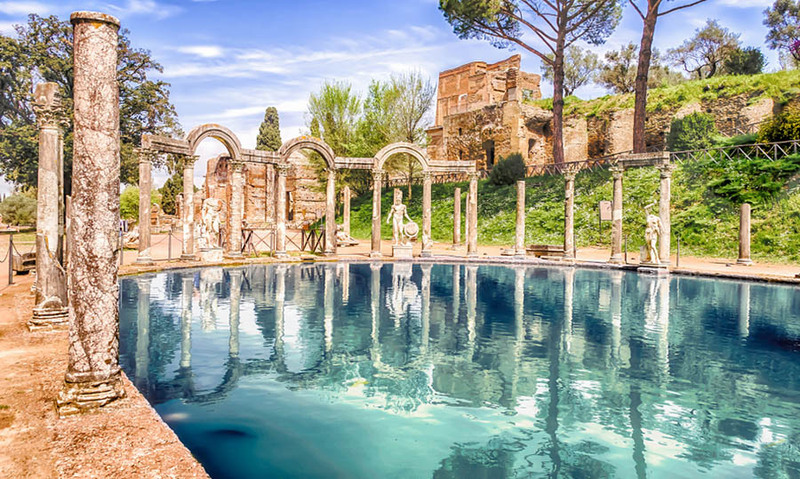 The pool became more important as a functional part of the household with the advancement of the Roman and Greek civilizations. Swimming and bathing in natural pools was common and, in fact, even Plato believed that all children should learn to swim as part of their education. Swimming became part of the training and conditioning for soldiers. As the wealth of the individual increased, a pool became possible for the average citizen. Pools were an enjoyable “status symbol,” and they were being valued for the ability to provide bathing. Eventually, people began to believe there were health benefits to be had with bathing and swimming. In addition, the pool could be used for religious purposes and for socializing—the first pool parties! Greeks had courtyards called “palaestras” where they would exercise and play games. Now, the pool would be added for swimming and bathing. Frequently, the pools included live fish. Nothing exemplifies the importance of pools to the Romans than the city of Bath in England. Bath is at the site of natural hot springs. Originally used by the Iron Age tribe of Dobunni as a religious shrine to their goddess Sulis, the site was taken over by the Romans when they invaded England. The Romans quickly built a complex of buildings that included the pools for bathing and heated rooms. 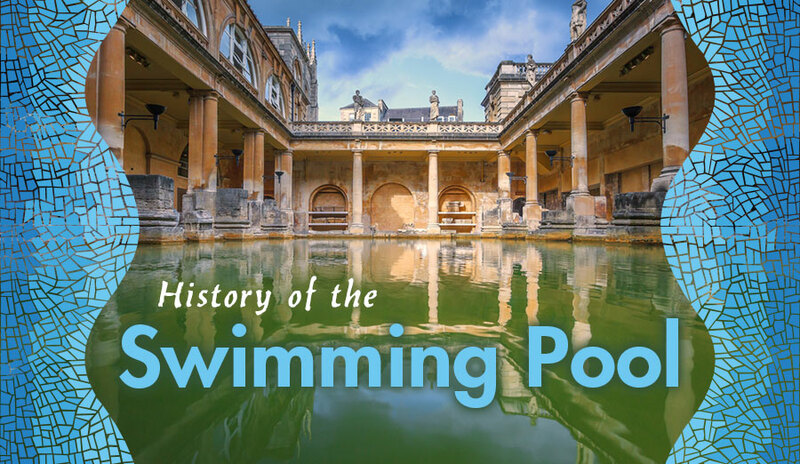 People traveled from all over England to use the pools in Bath and worship at the temple of Sulis. After the withdrawal of the Romans from England, the baths were left to deteriorate, and they were eventually destroyed. Then, in the 1700s, doctors began encouraging patients to drink the mineral waters for medicinal purposes. Soon, what is referred to as the “pump room” opened to the public. Bath became a destination once again for the sick and infirm. In the late 1800s, the remains of the Roman baths were discovered and restored. The Baths have been continuously improved since then, including a major renovation in 2011. There was not much advancement in pools or swimming until the 1800s. At that time, most swimming was done in rivers, lakes, and oceans. The breast stroke and side stroke were the only swim strokes. Swim clubs were organized with the increase of popularity of swimming both recreationally and for safety in and around the water. 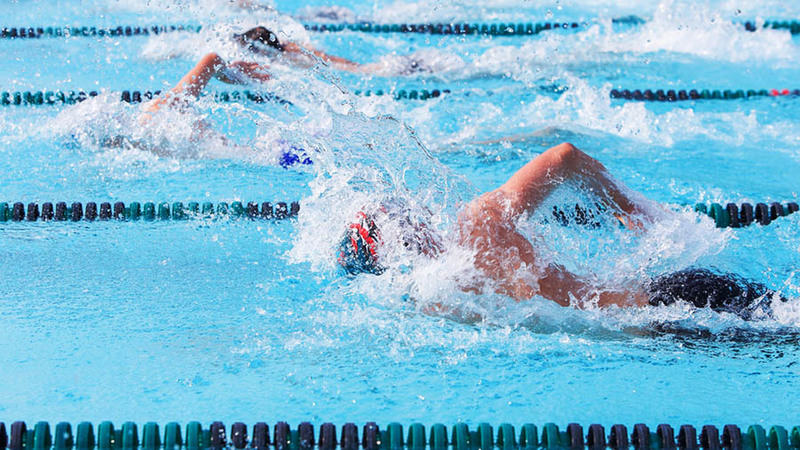 In the 1840s, the British were introduced to the “crawl” stroke developed in America. The breaststroke lost popularity to the faster and more powerful crawl. At about the same time, the British developed methods of sanitation and maintenance of the pools. More indoor pools were built around England, and competitive swimming became popular. The National Swimming Association of England was so instrumental in the development of competitive swimming that it was recognized as a legitimate sport and eventually led to swimming being included in the Olympic Games of 1896. However, by the time it was decided to include competitive swimming, it was too late to build a pool in time for the games, so the swim events were held in the ocean. Women’s swimming events were not included in the Olympics until the Stockholm Games in 1912. In the 1924 and 1928, Olympics Johnny Weissmuller won five Olympic gold medals in swimming for the U.S. In 1932, Johnny was offered a movie contract to play the role of Tarzan. The movie was a blockbuster success and led to a total of 12 Tarzan films, as well as a number of other movies. In the 1940s, a competitive swimming star, Esther Williams was unable to compete in the Olympics due to WWII. She joined a touring show of swimmers and soon also was offered a movie contract. Both actors were featured as swimmers in their respective movies and contributed to the popularity of swimming as a sport and recreation. They also helped to make the backyard pool a desirable status symbol. In the 1950s, hotels started installing pools as a desirable feature for your vacation stay. Public pools started to be added to the features offered by the local park systems. These both started as the rectangular pool, sometimes including a deeper end where the swimmer could dive from a diving board. Many of these public pools are now expanded into water parks. The pools are much larger, and many now have the zero-entry feature, so the swimmer can walk into the pool on a gradual slope. This makes the pool accessible to all people, including seniors, disabled, and young toddlers. The water parks have additional features such as large slides that can be several stories high, fountains that spray in all directions, and lazy rivers that are water “rivers” where you can sit in an inner tube and slowly travel through the course propelled by the current of the water. The larger water parks have a newer type of pool called a wave pool. This pool uses large volumes of water to simulate the waves of the ocean. The swimmers position themselves in the pool. The water is generally about three feet deep. There is a signal sounded that the waves are about to start, so the swimmer can be prepared for the force of the waves. Then, a series of waves are sent across the pool for a number of minutes. This is especially fun for the swimmer who does not have access to large bodies of water and who have never experienced the feeling of wave power. In the 1960s, newly designed and built high schools included competition swimming pools, and other communities built pool additions to the existing campus. Many of these pools were multi-purpose and were opened to the public for recreational swimming in the evenings and weekends. With the availability of competition pools, high schools began to offer swimming as a team sport, and more privately run swim teams began to form for the younger swimmers. The backyard pool also continued to grow in popularity. In the 1980s, the home hot tub or spa tub became very popular. Prior to this, these heated small pools were used mainly in health clubs and fitness centers. The spa became a popular backyard addition because of the development of the single-piece plastic shell that made up the tub. It made installation easy. The spa could be placed anywhere in your yard, even on an existing patio, and it did not have to be dug into the ground. The spa is small enough for even the smallest spaces. Another attraction was the price. A backyard spa is considerably less expensive than an above ground pool, and the cost of pool chemicals to maintain a spa can be significantly less expensive. This combination of low cost and the ability to install the hot tub in a small space opened the pool to a whole new group of potential buyers. Today’s pool owners can choose between an in-ground pool, an above ground pool, a hot tub/spa, or combinations of these pools. The backyard pool has become a “staycation” oasis in your own backyard. Some people push the backyard pool into the realm of backyard resort. One of the options for today’s pool owner are infinity pools where a side of the pool is made of glass, giving the illusion of infinity by blurring the line between water and sky. The infinity pool is particularly effective if the pool is located on a higher elevation than the surrounding landscape. Another option is the exercise pool. If you want to use your pool for improved fitness but can’t fit the longer lap pool into your yard, there are small fitness pools built which are long enough for the swimmer to stretch into the stroke form, but, rather than swimming a distance, you will swim against a current of resistance. Some pool owners want their pool to be unique and decide to build a free-form pool. The pool can be any shape and size, as well as different levels, sometimes connected by waterfalls or “streams” managed with recirculating pumps. Their pool incorporates natural hardscape, such as large rocks, to give the illusion that this is a natural pool rather than a man-made pool. Some pools are surrounded with extensive landscaping to enhance the mood the owner is wanting. For instance, if you use your pool mostly at night, you might want to have your pool be more romantic-looking with perhaps a moon garden where the silver and white flowers and leaves reflect the pool lights as well as the moon in a quiet soft atmosphere. On the other hand, if you enjoy your pool during the day and like to have lots of pool parties, you might be more interested in lots of color and a more exciting backdrop for your pool. The trend toward backyard pools continues to grow, and, with it, the choice of the pool type that fits your personal preference and planned use. The development of the above ground pools has made owning a backyard pool possible and affordable for more people. There are more options for the type of pool chemicals and the method of applying those chemicals that you choose to maintain your pool. All these improvements have brought backyard pool ownership to mainstream America. It is estimated that there are currently over 10 million pools in the U.S.